Fig 1. Examples of upper and lower screw retained prosthesis. Permanent or fixed teeth are prosthesis that are screw-retained into implants, that are surgically placed to the patient’s jawbone. Dentists referred to this prosthesis using various terms: hybrid or fixed detachable prosthetics, implant-supported fixed bridge, high water prosthetics, Branemark prostheses, or the Toronto bridge. Fixed for the patient, removable for the dentist. 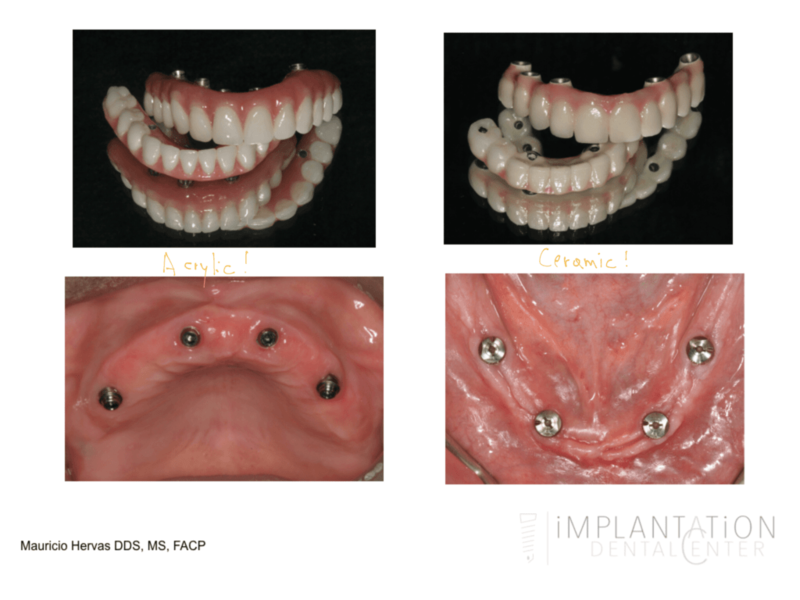 Permanent teeth for the patient, removable for the dentist. 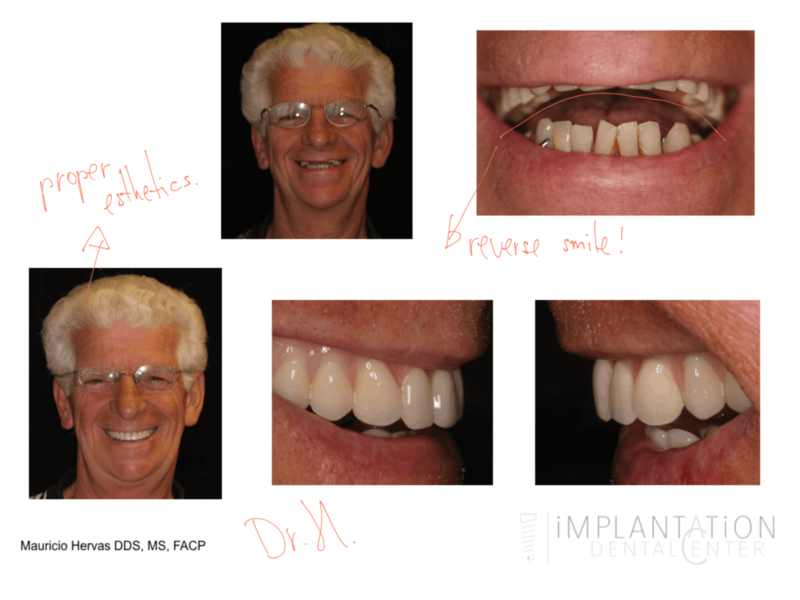 Fixed permanent teeth for the patient, removable for the dentist. The number 4 (four) plays a vital role in the protocol of this procedure. 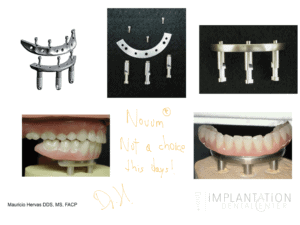 In the past, the Novum™ procedure (Fig 2), which used an all on 3 (three) system, was falsely assumed to be able to accomplish the procedure. 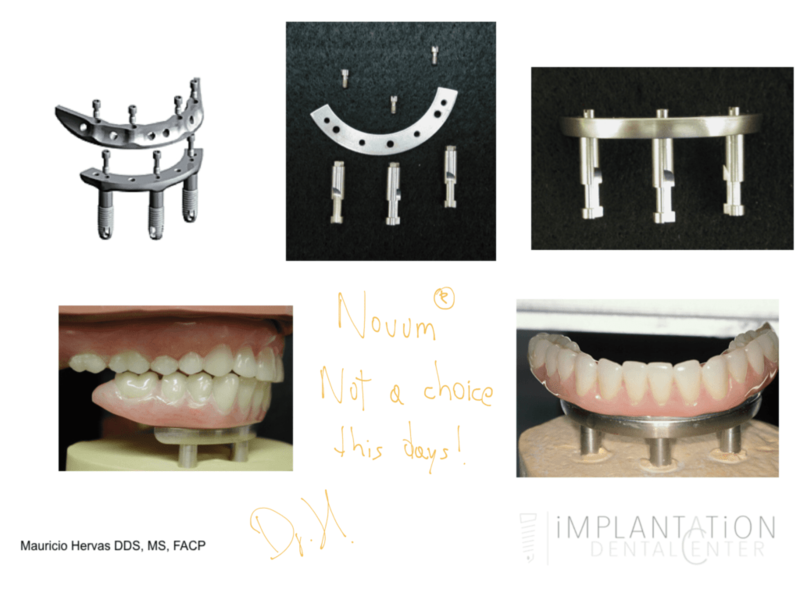 Novum™ is no longer considered to be a viable solution due to its incorrect premise that if you lose one implant, nothing can be fixed on the remaining two implants. The all on four is now the prominent system, especially when compared to a 4 leg table. Using the example of a 4-leg table, even if you remove one leg from the table, it can still stand while you fix it. The all on four procedures have been considered to be improved versions that are commonly discussed at dental conventions. Technically, the all on four procedures do not necessarily require that you have to have exactly four implants in order to follow this protocol. It could be five, six, or more implants; but, usually not less than four implants. It should be acknowledged that four implants be favored since they are usually needed if the implants can be placed well spread apart to prevent rocking, minimizing the anterior-posterior distribution of forces, minimizing the posterior cantilever, or if the procedure finds that concentrating the forces in the middle of the prosthesis is favorable. 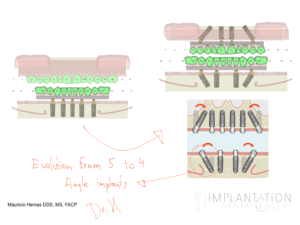 In addition, this protocol may have some angle implants posteriorly that can vary from 15 to 30 degrees (to aid in the maximization of surface area). (Fig. 3 a and b) In the past, utilizing the all on four procedures was unthinkable because there were no components to bring the angulation into the same path of insertion as to the anterior implants. Fig 3. A. Angle correction using angle abutments. Fig 3. 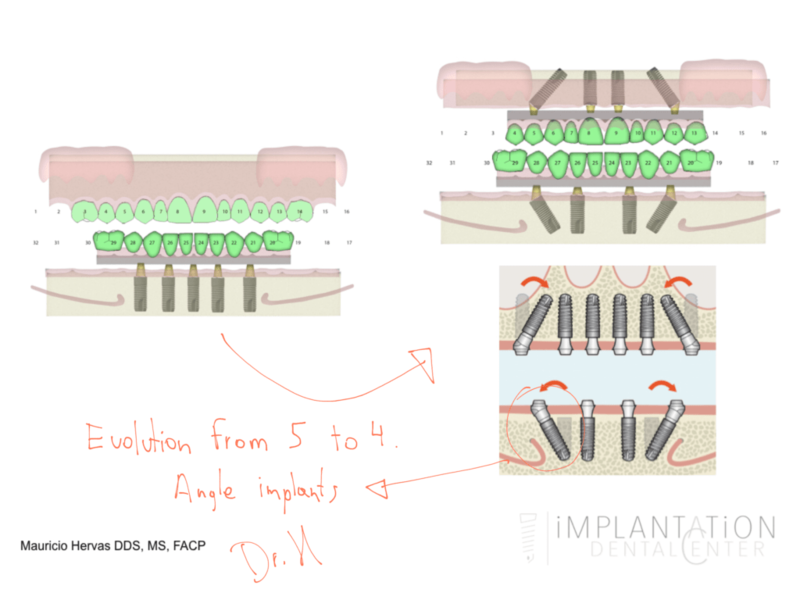 B. Evolution from 5 to 4 implants due to angle abutments. Nobel Biocare™, as mentioned previously, has a trademark registered for All-on-4®. Other companies have named the same procedure as: Smartfix® by Denstply, Straumann Pro Arch by Straumann, Diem 2 by Biomet 3i™, and TeethXpress® by Biohorizons. 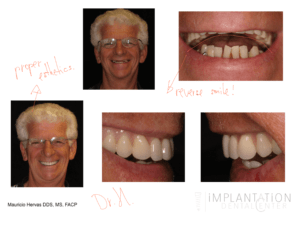 In essence, major implant companies have created components to attach a denture into implants. Some very recently compared to the original over 10-15 years ago. So, why was All-On-4 created? How is it implemented? The all on four concept was created in order to provide immediate solutions to patients requiring permanent or fixed teeth. Let’s split into upper and lower arches: Maxilla and mandible. Fig. 4-B. 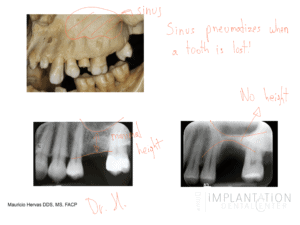 Sinus pneumatization when a tooth is lost. After a comprehensive examination is performed, that includes radiographic evaluation, 3D bone beam imaging, and a CT Scan analysis utilizing a 3D software, it is determined that the remaining teeth are not suitable for maintaining adequate oral health. An extraction is recommended (tooth removal) or when you were edentulous (with no teeth for a while) and you only want something fixed, that you won’t remove, then this protocol might be for you. Fig. 5 Close proximity to IAN (inferior alveolar nerve). How is the All-On-Four procedure performed? There are some very important questions that are addressed differently, by different operators. This procedure was created in order for you to have teeth immediately after the surgery. Immediately means right after surgery – in the afternoon of the surgery if the surgery was in the morning, next day, 48 hours after the surgery. It does not usually mean three to five days after surgery (like procedures of the past). When a protocol refers to a few hours or days, it is called immediate loading. Now, it’s important to understand that the all on four protocol has two components: The surgical component and the restorative protocol. The surgical protocol (or surgical phase) is when all teeth are extracted, and the four or more implants are placed. If you don’t have any teeth it might be faster. If you have teeth and they need to be removed, it might take longer, meaning a few more minutes. Some dental offices or practitioners may want to take all of the teeth out first, allow the patient to heal for a few months, then place the implants. Meanwhile, the patient wears dentures. 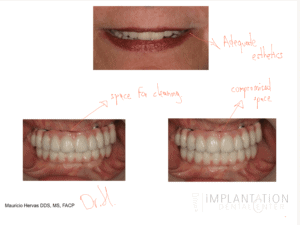 In my opinion, this is a waste of time and defeats the purpose of this technique – this is not how it’s performed at Implantation Dental Center. What is important to discuss at this time is the amount of bone needed for reduction in order to create space for prosthetic components. This is called alveoloplasty or as simple as tableling the bone. It doesn’t hurt. The bone is reduced based on a stent or guide using a bur under copious amounts of water. A saw or piezoelectric might also be used for this task, which takes about 2-3 minutes. This step is maybe the most important concept of the All on four. At this point is where you chose the right practitioner or specialist. Otherwise the treatment will not have a satisfactory result and prognosis. Do I need a bone graft for the all on four protocol? Most often the answer is no. It is a protocol where no additional bone is necessary. Some literature might consider a graft-less (or graftless) procedure. When you reduce the bone, the dimensions for bone housing increases, unless the CT Scan shows something different. If the surgery is scheduled in the morning by 9:00 am there will be particular steps prior to the implementation. These steps would include applying a topical anesthetic, giving you local anesthesia, beginning the surgery by flapping, reducing the bone, or by performing the extractions. By 10 or 10:30am the surgery should be close to being finished. 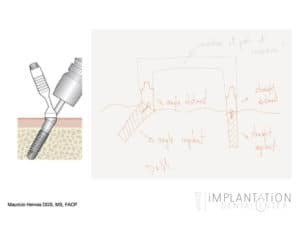 The last part of the surgery involves adapting the angle abutments that make the angle implants in a straight line for an adequate path of insertion of your prosthesis. Fig 7. Patient presented with un-esthetically pleasant smile: reverse smile. The new prosthesis will correct all inaccuracies. 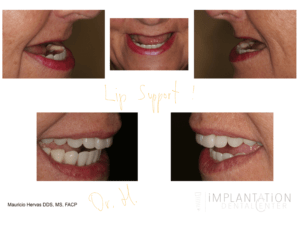 The second phase is the restorative phase and it should be done by a specialist, a prosthodontist, or a surgically trained practitioner that will connect the prosthesis to the teeth. Specifically, a prosthodontist will take an impression of you implants, connect the surgical guide to the implants, register your bite, your vertical dimension, and send the impression to the lab to have the prosthesis made. If the patient has their own prosthesis, it can be modified into your new prosthesis and connected to the recently placed implants to make it fixed. This may also be done while you wait in the chair. A very important observation: The prosthesis should be made in a laboratory, but the dental technician hands should never at any time be in the patient’s mouth. In the marketing arena, this type of protocol can be searched as Teeth in a day, Teeth in an hour™, teeth tomorrow, same day prosthesis and so on. How do you know the tooth implants are ready for loading? We measure ISQ (Implant Stability Quotient), which uses a patented technology RFA (resonance frequency analysis) by Osstell. A fascinating state of the art technology that assess the progression of osseointegration. This answer can shift depending on literature, but in our experiences, the answer is Yes. This is because when all teeth are removed, and the bone is curettage or plasty, we think the cells fight to produce bones instead of having to fight the infection now and fight to produce bone. The final prosthesis begins fabrication two to three months after. The osseointegration should be complete by now and the gums should be healed. The gums shouldn’t recede anymore and the space below your prosthesis is stable. This space is of prime importance; it will help maintain adequate hygiene. Fig 8. Minimal space for cleansability. The prosthesis should be removed every 4 to 6 months. This is considered maintenance. Every time the prosthesis is place back in the mouth, new screws will be used to accompany the maintenance. Practitioners will not want to use already fatigue screws that might brake and will be difficult to remove. It is recommended to invest in new screws every time you come for a cleaning. The cost is between $60-$80 added to your maintenance fee. The total cost will range from $ 250 to $300. Expect your appointment to last around an hour or two for the removal of your prosthesis, inserting in an ultrasonic cleanser, and replacing the prosthetic screws. Now that we have explained all your surgical and prosthetic phases, let’s discuss All On 4 implants cost. The surgical fee is very standard among specialist. They range from $12,500 to $ 14,500, depending on the need for extractions and the desire for sedation. If there is difficulty or a risk of compromises, this may also affect the fees. The prosthetic phase might also have some wider ranges in fees depending on the materials used. The traditional all-on-4 prosthesis will cost you $ 12.000 and it is made in metal-acrylic. Zirconia or ceramic prosthesis may cost an additional $4.000 to $5.000 depending on the patients’ expectations and desires. There are also new materials, a very high performance polymer called Pekkton®, which replaces the metal underneath (Poly-Ether-Ketone-Ketone PEKK) that can give you a very esthetic outcome for about $ 12,500. Some patients may have so much bone that they would rather not reduce all that bone to house the prosthetic components or they may have the possibility of not having either pink acrylic or ceramic. There are numerous issues that can increase fees. Financing will always be a challenge when it comes to a commitment or decision. We are glad to offer two major options for financing. LendingClub and CareCredit offer custom payment plans that can be discussed based on your ability of repayment. Affordable and fixed monthly plans are available. Major insurances companies like Medlife, Cigna, Humana, Aetna, and Avmed might cover the extractions and/or immediate dentures. We would be happy to submit your claims for you! 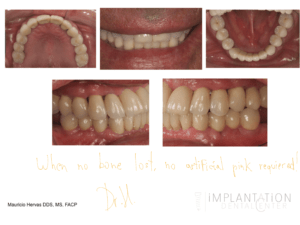 Am I a candidate for all on four or for fixed implant reconstruction with bridges? If you have formulated these questions, then you have done some very good research and understand very clearly your wants and needs. Fig 9-B. Pink required to compensate your bone loss or to house the prosthetic components. 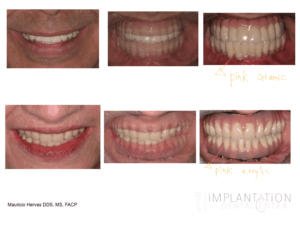 Usually these types of treatments are able to accomplish their goals with 6 or 8 implants. They may also need some sinus lifts, bone grafts, and a more detailed and skillful surgery will be done because the implants cannot be placed in between teeth spaces, otherwise the esthetics is off the charts. The only problem is that not everybody is a candidate for this prosthesis because the bone and gums are just not there and we have to compensate with pink, or very long teeth. 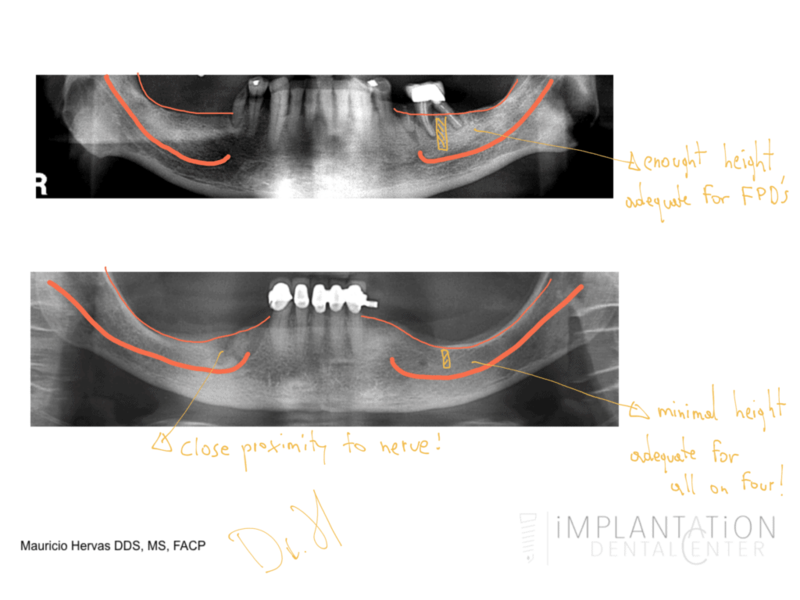 Currently with all the advances in technology, CT Scans, digital scanners, digital models, and how implants can be guided, meaning the implants are placed according to some software like InVivo 5 by Anatomage or Simplant by Dentsply and utilizing guides made by Materialise for a minimal invasive surgery. 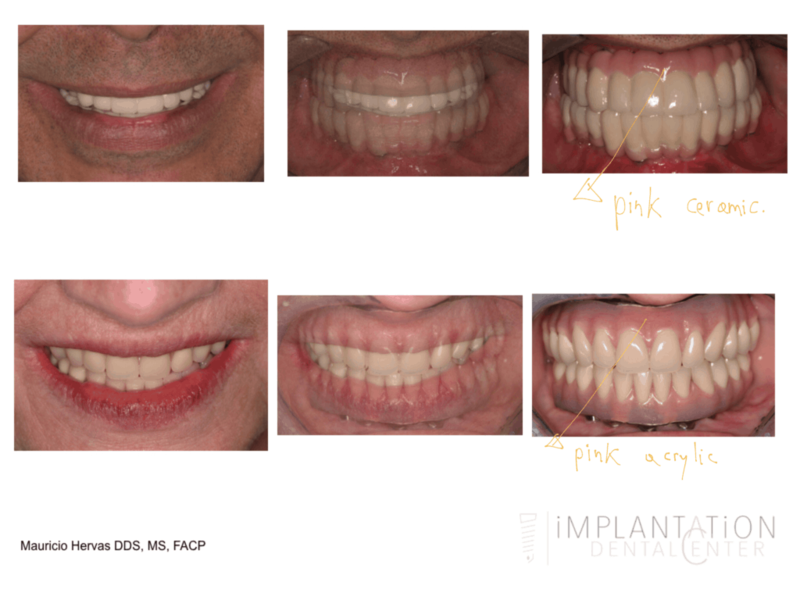 We are presently using the most reliable materials to minimize errors at the time of implant placement. Does All-on-4 hurt? Will I feel any pain? This is a commonly asked question. Once the anesthesia starts to fade, you will already be taking NSAID (commonly ibuprofen 800 mg three times a day). Remember, bone by itself, does not have innervation, the flaps will be very closely when you are resting comfortably at home. Some patients require the help of opioids/narcotics such as Percocet, Vicodin, or Vicoprofen. Some patients express that they only need pain relievers for the first night. If you have infected teeth, an active periodontal disease, or medically predispose factors, you will be prescribed antibiotics to begin 24 hours’ prior the procedure. Dr. Mauricio Hervas is a board certified prosthodontist and a board certified oral implantologist. There are only three such practitioners in the south Florida region. In the Miami-Dade County Area Dr. Hervas serves in the following cities that include: Aventura, Coral Gables, Doral, Key Biscayne, Miami, Miami Beach, North Bay Village, North Miami, South Miami, and Sunny Isles. In the Broward County Area, Dr. Hervas serves in the cities of Weston, Plantation, Fort Laudardale, Davie, Sunrise, Boca Raton, Coral Springs, and Tamarac. The Palm Beach County Area cities include: West Palm Beach, Jupiter, and Stuart. Dr. Hervas will undoubtedly be your clear choice when selecting the best practitioner or center for your all on four needs. For our out-of-state and international patients, the Sheraton Hotel is available for your stay and is located in Plantation, just minutes from our practice and only 15 minutes from the Fort Lauderdale, FL airport. Jensen, O. T., et al. (2011). “The all on 4 shelf: mandible.” J Oral Maxillofac Surg 69(1): 175-181. Jensen, O. T., et al. (2010). “The all on 4 shelf: maxilla.” J Oral Maxillofac Surg 68(10): 2520-7. Del Fabbro, M., et al. (2012). “Tilted implants for the rehabilitation of edentulous jaws: a systematic review.” Clin Implant Dent Relat Res 14(4): 612-621. Papaspyridakos P., et al. 2014. “Implant loading protocols for edentulous patients with fixed prostheses: a systematic review and meta-analysis”. 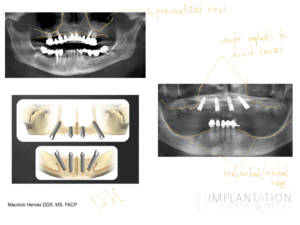 Int J Oral Maxillofac Implants. 2014;29 Suppl:256-70. doi: 10.11607/jomi.2014suppl.g4.3. Yilmaz, B., et al. (2015). “Using the “final-on-four” concept to deliver an immediate metal-resin implant-fixed complete dental prosthesis.” J Prosthet Dent 114(2): 161-166. De Bruyn, H., et al. (2014). “Immediate loading in partially and completely edentulous jaws: a review of the literature with clinical guidelines.” Periodontol 2000 66(1): 153-187. Tealdo, T., et al. (2014). “Immediate versus delayed loading of dental implants in edentulous patients’ maxillae: a 6-year prospective study.” Int J Prosthodont 27(3): 207-214. Turkyilmaz, I., et al. (2009). “Early load mandibular hybrid prosthesis using the Ohio State University acrylic frame requiring no final impression.” Aust Dent J 54(3): 255-261.